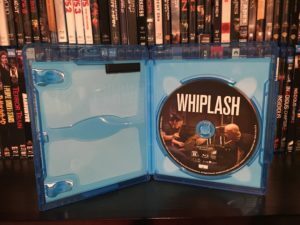 Whiplash - Blu-ray Review - ReDVDit! It begins with a heartbeat, steady and calm. The pace starts to quicken and it is not out of control, not yet, but everything is moving a lot faster. As the pace gets faster, you sense chaos and loss of control however, every beat is quickly followed by another, somehow soothing and encouraging to know what will follow. Then without notice, everything stops. This is not a description of the film Whiplash. This is a description of the first sixty seconds of the film, and it sets the tone very well for the rest of the film. I use the term heartbeat rather purposefully, not only from experience but as the film will show so much rides on the ability of the drummer to keep the band and ultimately the composition alive. 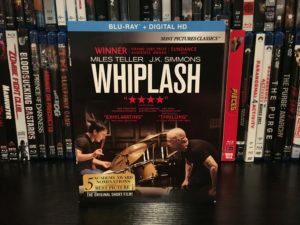 Whiplash did something for me that no film has done in quite some time, it completely took me by surprise. 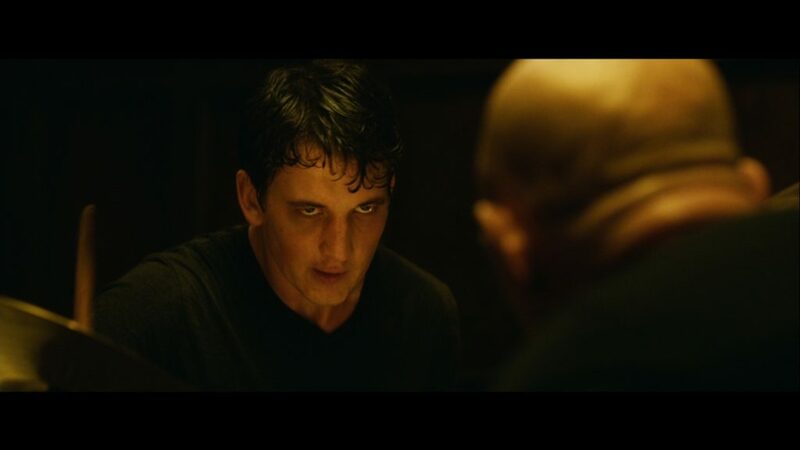 I am going to be completely honest with you and admit that, as a whole, I was not a fan of Miles Teller before I saw this film. The only reason I sat down to watch this was out boredom and curiosity. So many people seemed to be talking about J.K. Simmons’ performance that I felt I must see what they were talking about. This is the exact reason I tell people to try and give every film two chances (and yes I mean every film). If I had not given this film a chance, I would be missing out on what turned out to be one of my favorite films. Whiplash is a roller coaster with the beginning of the film is your climb to the top. As you climb everything seems to look better and better from this height. You start to feel safe and then before you know it, it’s the inevitable drop – followed by twists and turns and small rises and falls. I guarantee by the end of this film you will feel something and I’m confident it will be different for everyone. Our film follows Andrew Neyman, a young hopeful conservatory student trying to make his way as a studio drummer. In comes Terence Fletcher, a teacher who is known for leading the top studio band at Shaffer Conservatory and thus one of the top studio bands in the country. Andrew starts to rise to the top but soon discovers that Fletcher is a verbally abusive, abrasive, and destructive individual whose only desire seems to be emotionally destroying each and every student that he comes across. As obsession and sanity start to entangle and the competition grows close, everything starts to fall around him. Will Andrew reach his dreams and earn the respect of Fletcher and ultimately himself or will his sanity break and cost him everything? You will have to watch as the music unfolds to find out. Using the Arri Alexa and a series of artfully crafted shots, we have been delivered with a Blu-ray experience like none other. 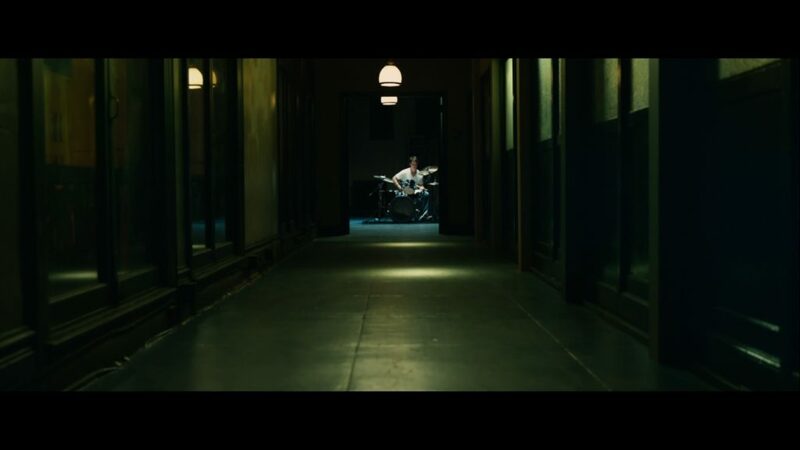 Being one of the only great movies that is mostly about drumming, they were able to take a lot of risks and what we are left with will change the idea of filming for this sort of movie for years to come. The filmmakers were really able to let the audience feel the emotional struggle for sanity through the the use of tight shots in just the right spots. I feel like i must point out there are shots in the movie where the sound does not seem to line up with what you are seeing, however it is not only in sync, but is also purposefully done so. Due to the high speeds of the drumsticks there will be moments that do not seem to line up but it is all a part of the experience that is Whiplash. Whiplash is presented on Blu-ray with an electric DTS-HD Master Audio 5.1 track. This movie has a certain rhythm to it. It’s electric and mesmerizing. The jazz throughout the film carries the well-written script and as the tension builds, the score accommodates. Admittingly, I find that there are some editing issues within this film and it can get quite loud without notice. At times, I found myself glued to the remote control, but it is to be expected from a movie of this subject matter. Overall, something is to be said about the ability to evoke emotion through filming and sound and this movie found the sweet spot and quickly. Unlike most of the aspects of this film there is not much to be said about the packaging of this film. 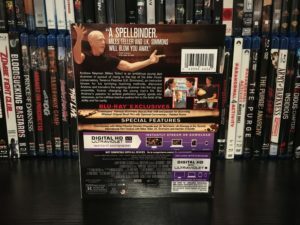 This edition came with Blu-ray and Digital copy and is packaged in a typical one-disc Amaray case. The cover art does little to impress and especially considering the other art options that were available and the steelbooks that have been released since, it makes this standard edition seem all the more disappointing. We are introduced to several prominent drummers and their introduction to drumming. Including Chad Smith (Red Hot Chili Peppers), Doane Perry (Jethro Tull),Gina Schock (the Go-Go’s), and many more. The 17:56-minute short that started it all featuring J.K. Simmons in the same role however the lead is played by Johnny Simmons. A scene with J.k Simmons as Fletcher in what I imagine is a deleted scene even though it is not marked as one in the menu but it is marked on the back of the case as such. I am certainly glad they left it out the film would not have benefited from it at all. An Evening at the Toronto International Film Festival with Miles Teller, J.K. Simmons and Damien Chazelle. A previously filmed Q & A that took place during the festival. Whiplash is different. As a whole the film comes across very real, and takes you through a roller coaster of emotions. Miles Teller took it to a place that I was not expecting with an exceptional performance that will not be soon forgotten. The real star actor of the film is without a doubt J.K. Simmons. I can honestly say that I did not know this type of performance was in him but I am certainly glad that there was a script out there that could really bring it out of him. This is one that any real collector should own. I would suggest shopping around a bit because I have seen a couple of different versions. The good news is that for this one, the film is the real star and no matter what edition you go with you have got a great film on your hands and one that will become one of your favorites rather quickly. You can purchase this edition HERE.